When you think of Oxford, rich culture and artistic history should be the first thoughts that come to your mind. William Faulkner, John Grisham and Modest Mouse are a few of the well-known artists with Oxfordian influence, but one more obscure artist that everyone in this town should know is Dex Edwards. Edwards is an associate professor in the theatre department at Ole Miss, but around the world, he is known as something more. After being the artistic director for the world’s biggest baseball, which ultimately brought the 1996 Olympics to Atlanta, it’s no wonder his shows have become some of the most anticipated productions on campus every season. As the only person in the state of Mississippi who is a member of United Scenic Artists, he is a man among boys in the theatrical world. His concepts bring meaning to a lifeless script and his designs can transform a few pieces of scrap metal into a moving replica of a 1920s car. 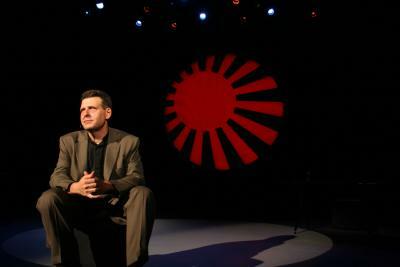 “The Rising Son: a story piece” is a one-man show both written and performed by Edwards himself. A story about his life (and quite a few strange happenings along the way) stands out as one of the most honest and well-produced shows in the past few years on this campus. The writing alone sets this play apart from many I have ever seen before. His simple life anecdotes turn from playful to philosophical with a simple twist. The story he tells about his temporary assistant, Kenichiro Komura, reflects his own loving feelings for his son and the multiple parallel plot lines intertwine to create a beautiful two-hour performance piece that is nothing short of amazing. The colors of evil are used to connect two stories that would never have been together seamlessly. There is no way to simply summarize this story into a few words, but the profound effects of the story will stay with audiences for years to come. The acting in a one-man show is always tricky; separating each character with no props or costumes is quite a task. Edwards used many voices, mannerisms and postures to distinguish between the diminutive Mrs. Komura, the muscled Brent and everyone in between with ease. His connection to the story gave him a slight edge, but the honesty behind his characters and the true emotions he portrayed bring a whole new life to the show that could not have been done by anyone else. The set consisted simply of a table, two blocks and a stool with a large disc hanging as backdrop. With the hundreds of projections mixed with the five set aspects, it was always clear where we were and what was going on in the scenes. Even when Edwards pulled out his pointer to lecture the “class” on how exactly a heart works, nothing in this show was ever done in vain. One of the most important aspects of a show with minimal set dressing and no character or costume changes is the music. Music is what brings you into a Japanese hotel room or back 20 years into a dream sequence. The minute the music ends, it’s clear the location has changed from Atlanta to Tokyo and back into the inner-workings of Edwards’ mind. Alex Mauney, sound designer, pulled songs that fit in perfectly as quiet background music with a distinct intent while still leaving places in silence for a more dramatic effect. Overall, this show was a well-needed shove back into the arts and culture for the semester and hopefully is a predecessor for six more wonderful shows in the Ole Miss Theatre Department’s season. With as much experience as Dex Edwards has had, not only in the theatre, but in his life, it is no surprise that he is an artistic visionary with a very different grasp of reality than the majority of the population. His personal adaptation of “A Christmas Carol” will be running at the end of this semester, and it will definitely be a sight to behold. Next Fair-weather fans, stand up.